In a remote, enemy-held valley in Afghanistan, a Special Forces team planned to scale a steep mountain to surprise and capture a terrorist leader. But before they found the target, the target found them . . . The team was caught in a deadly ambush that not only threatened their lives, but the entire mission. The elite soldiers fought huddled for hours on a small rock ledge as rocket-propelled grenades and heavy machine-gun fire rained down on them. With total disregard for their own safety, they tended to their wounded and kept fighting to stay alive. When the battle finally ended, ten soldiers had earned Silver Stars-the Army's third highest award for combat valor. It was the most Silver Stars awarded to any unit in one battle since Vietnam. 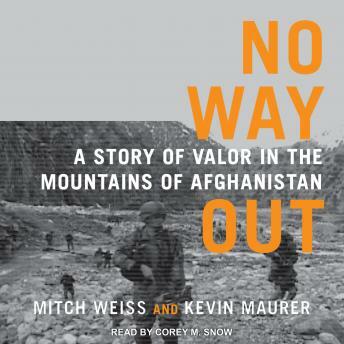 Based on dozens of interviews with those who were there, No Way Out is a compelling narrative of an epic battle that not only tested the soldiers' mettle but serves as a cautionary tale. Be careful what you ask a soldier to do because they will die trying to accomplish their mission.